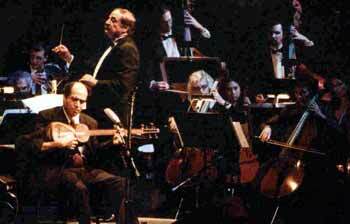 The sama'i musical form originated in Turkey and has spread throughout the Middle East. Kurd is the Arabic or Turkish name for the Phrygian mode. Composing a sama'i requires strict adherence to the recognized structure. The form is characterized by a 10/8 rhythm in the first three sequences typically followed by a fourth sequence of a different rhythm. The second and third sequences typically include modulations to other modes (maqamat). The repeated refrain remains in the 10/8 rhythm. Count along! Americana revisits music that emanates from our 19th century heritage. Bob Applebaum and Miamon Miller respectively have arranged two Stephen Foster favorites: "Hard Times Come Again No More" and the well-known "Beautiful Dreamer" (the last song Foster composed) in a manner that illustrates their timelessness and musical flexibility. In the third section, Miamon rearranges and recomposes the folk tune "Devil's Dream" and a quasi-Arabic version of "Old Joe Clark" utilizing a theme and variation form. 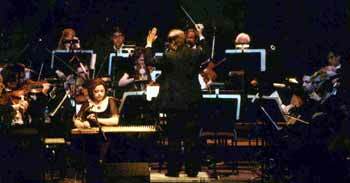 This is the world premier of the Tar virtuoso Mohammad Omranifar's composition for Tar and orchestra. Originally in three movements, the first and third will be performed this evening. This composition is written in Mogham Chahargah in the key of C. In Azeri music, there are seven different scales called Moghams and each Mogham contains many branches called Gooshe(s). This composition is one of the most well known pieces of Taiwanese folkloric repertoire. As in numerous Chinese-Taiwanese numbers, the title of this piece was inspired by nature. One can easily recognize the musical scale of the Far East employed in this music. This arrangement is faithful in its sonority and tone quality characteristic of this style. The piece features the Middle Eastern Ud, played by Fahd Shaaban in the composition's style with an introductory Taksim (improvisation) and short solos within the piece. Composed by Nicolo Paganini (1782-1840). 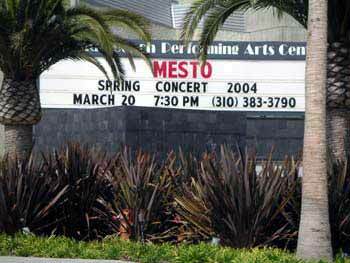 Tonight's performance is arranged for MESTO by Shelly Cohen. The fast and complicated passages require a high degree of instrumental technique. Composed as variations for the violin, performing this composition on a kanun will demonstrate Lilit Khojayan's virtuosity on this instrument. 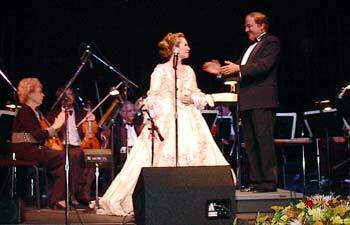 Anne-Suzette, in her first performance with MESTO will sing Adele's "Laughing Song" from "Die Fledermaus" by Johann Strauss, the most loved operetta by the Waltz king. Anna-Suzette is a true rising star. We will hear her high and sophisticated vocal capabilities demonstrated in this song. This composition is exclusively for string instruments that are plucked rather than only bowed. The first section features pizzicato technique by the all the strings. The second section is a dialogue between celli and all the strings playing in pizzicato. The third section is a deviation from what is expected since Azzam has entrusted the melody to the double bass while the strings are all used as percussion instruments. In the last measure, the percussion and wind sections participate in a grand finale. Tonight, our star singer Hamid will perform three songs that have become a permanent part of Egyptian vocal repertoire because of the extraordinary voice and long-lasting, widespread popularity of Abdal-Halim Hafez (1929-1977). The first one is Awwil Marra Thibb Ya Albi - My First Love. Lyrics by Isma'il al-Habruk and music by Munir Murad. Hafez's popularity in Egypt and throughout the Arab World was often compared to Elvis Presley in America. The romantic, dark and handsome star soloist, nicknamed Al-Andaleeb Al-Asmar (the dark nightingale) became an integral part of Arab music legacy. The score captures the essence of the movie "Zorba the Greek" which was adapted from a novel by Nikos Kazantzakis and propelled its composer, Mikis Theodorakis, into international prominence. Who would have thought you could write a musical based on the lives of "CATS"? Well, Andrew Lloyd Webber did, and what a success it continues to be. The show opened on Broadway in 1982 and to this day is in production somewhere around the world. The song "Memory" is perhaps the most well known number from the show and surely will evoke a memory or two from any audience that hears it. Listen and think "CATS". You will love it. This is the world premier of his 1998 composition, intended as a wedding march with an Indian theme. The composition is characterized by a lyrical and romantic melody. There are four distinctive themes. Nabil Azzam composed "The Crescent" for violin with an introduction on the buzuq (long neck lute) and a drone on the Indian tamboura with a variety of percussion instruments including tablah, udu, riqq and cymbals. Lyrics by Kamil al-Shinnawi and music by Muhammad `Abd al-Wahhab. An enduring, emotional song that is still reverberating from the early seventies. 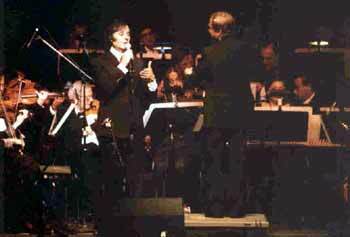 Its demanding orchestration and sophisticated solo vocal line make it hard to perform. 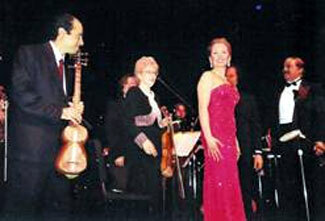 Our star singer Hamid is one of very few in the Arab world who can perform it at this level of musical accuracy. Lyrics by Mamoun al-Shinnawi and music by Baligh Hamdi. This was one of the very first songs that Abdel Halim sang at the beginning of his career. It was also one of the very first songs B. Hamdi composed for the young singer. Many of the audience will recognize the melody since it was sampled by an American Rapper. We will have the chance to hear it from Hamid in a style almost identical to the original.